In the visage of our beloved science, the time is now upon us to restore justice by giving tribute to a man who has devoted himself wholeheartedly and suffered for his beliefs. In 2014, 26 years has passed since the J. Benveniste publication in the Nature journal, from which came the discovery phenomena journalists now call "Memory of Water”. 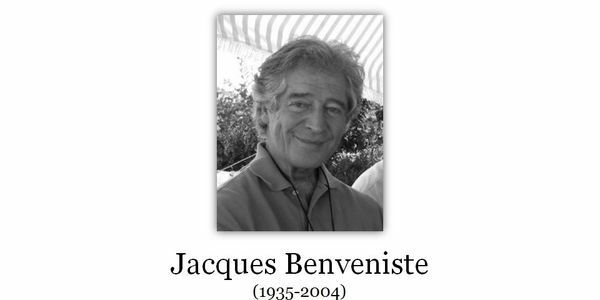 Because his experiments were contrary to current knowledge and concepts, Jacques Benveniste had been rejected by the scientific community, deprived of laboratory accesses and dismissed from the INSERM in Paris. His profound research had damaging implications to the reputation of the institution that once embraced his work. The Presented materials stand as a foundation for the justification of Jacques Benveniste and his research discoveries. The discoveries by Benveniste has a great social value and these phenomena have vast applications in deferent areas of human activity. It is needed to expand the researches of "Informational Copies" (IC) of material media. Jacques Benveniste was a Great French Scientist unfairly rejected by the scientific community and misunderstood by his contemporaries. Please, join us in our righteous efforts by signing onto our international initiative group. Our main initiative is the restoration of the honest name Jacques Benveniste. Thank you for the many signatures and for the beautiful words in support of Jacques Benveniste. We propose your further support for water memory & digital biology based technologies.